Size 6 - $24.99 Only 9 left! Size 8 - $24.99 Size 10 - $24.99 Only 7 left! Mask also has eye, nose, and mouth holes should you want to change up the look! So, your kiddo wants to be a zombie hunter? Hmm, it's a dirty job but someone needs to do it otherwise those biters will be swarming in no time. Yeah, that peaceful volleyball tournament you guys are organizing is gonna be a real mess. The most important part of becoming a zombie hunter? Know the rules! The first rule, as we all know, is to keep up with that cardio. Encourage him to join track of field (hey, those javelin skills could come in handy, too!). Another important rule: be careful when it comes to bathroom time. This means no zoning out to Youtube videos, kids! Get in and out as fast as possible, it's an actual life or death matter. Hmm, maybe no you won't have to wait a long time to used the bathroom. See, everything has it's upside. Now, this last rule you might already harp your kid about all the time. Snap the seatbelt on, every time! Yessiree, even the toughest zombie hunters use this simple safety device. When the walking dead are wandering around, why take chances on basic safety? 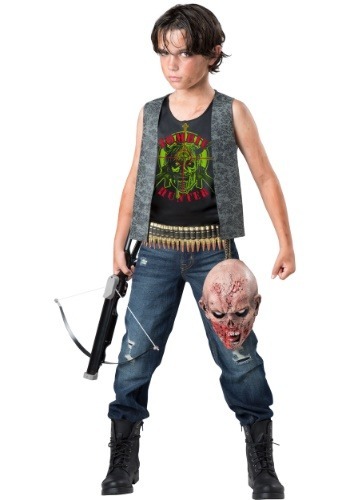 As long as your child follows the rules and gets set up in this professional zombie hunter uniform, we're sure they will make a great zombie hunter. The ensemble includes the tank with graphics, a faux leather vest, and a faux bullet belt. Your kiddo will even get a zombie mask just in case everything goes desperately wrong! Now, we're not looking forward to the inevitable zombie apocalypse but we do feel better knowing that toughies like yours are already patrolling the street. Those zombies won't stand a chance!